One reason we buy from Amazon: plenty of reviews. But what if many of Amazon’s top-reviewed items have fake, paid reviews? Amazon: you can do better. I subscribed to announcements of websites for sale on Flippa. Over the past several months, I’ve noticed an interesting pattern. Flippa is filled with auctions for websites promising easy revenue. Above are two sites by the same seller. The email summarized a couple listings for websites being auctioned. 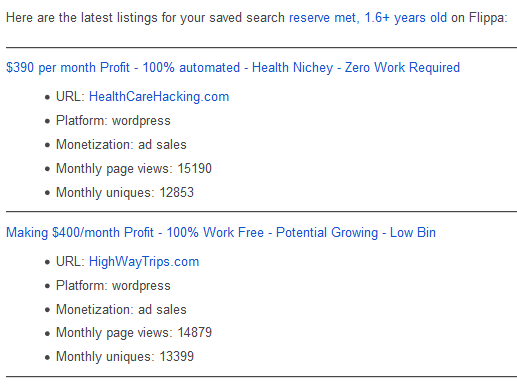 Both of the above listings make promises in the headlines for 100% “automated” and “work-free” sites. If the owner had such successful, automated sites, why would he be motivated to sell them? This should at least raise suspicion. Note the spike in traffic for the past month. 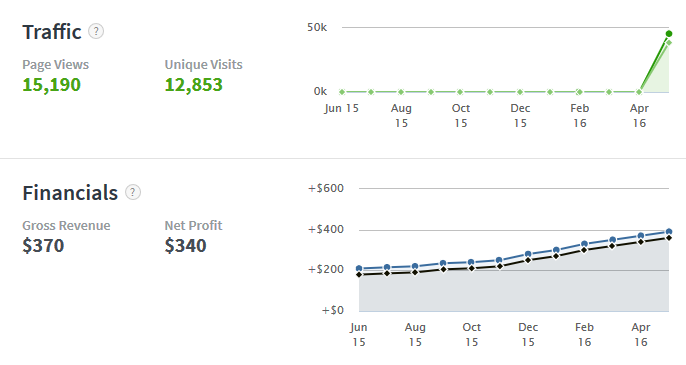 0 to 15k visits in a month! What a massive upward trend, right? But wait, it seems that the traffic has extremely little correlation to ad revenue. We see a claimed steadily increasing monthly ad revenue report, which should normally strongly correlate with traffic. One explanation is that the owner just installed Google Analytics last month, and traffic stats started accumulating then. Another explanation is that the author somehow spiked the traffic stats for a month. Suspicious of the source of this traffic, I checked Alexa, a web traffic analytics company. According to Alexa.com, the vast majority of traffic comes from India. Why might that be? One easy way to inflate traffic stats is to artificially and temporarily increase them by hiring cheap labor and/or automated “bots” (computers) to visit the site. 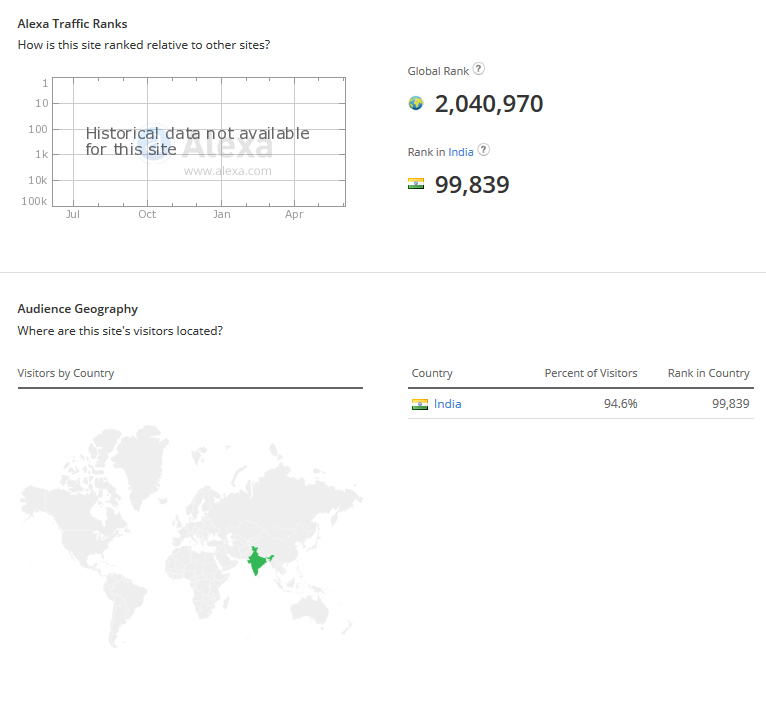 Since the same seller had listed each site, was it any surprise that both sites had the vast majority coming from India? This proves nothing, but is certainly alarming, since there’s no particular reason to expect the vast majority of traffic to come from India for sites like these. The seller claims in the listing title that the site is 100% “automated.” If this is the case, then how is the copy being written? Or, are articles just scraped (copied verbatim) from other sites? One way to see if the content of the website was copied is to search a string of text that should be unique to the site. In this case, a Google search reveals that the copy for the test string I chose is found on over one-thousand other sites. This suggests that the copy for this site is most likely scraped from other sites. Google is known to strongly penalize sites for this behavior. We can take a guess, with pretty high confidence, that the site for sale is not the original creator of the “automated” content. So, in other words, the “key” to success is not leaving the site on autopilot, and “unique” [sic] – unique content, that is. As demonstrated, this site is far from “unique,” having articles that appear on a thousand other sites. This type of listing is extremely common on Flippa. I’ve noticed this pattern over the past several months. I’m not the first to observe that the site is rife with scams, though. Feel free to learn more about the scams on Flippa. On a final note, not everything sold on Flippa is junk – just the majority! Buyer beware! Why do most day traders persist, despite a lack of success? I’ve listened to several day traders speak at length about their progress, and heard a common thread: in explaining their slow progress, they speak of the difficulty of mastering their emotions. The traders don’t know each other, but they follow the same approach to learning the discipline: they trade real stocks with real money in real time as they hone their skills. These traders correctly identify that regardless of the overall accuracy in their trading strategies, they will have ups and downs. However, when explaining long-term failures, they continue to cite a lack of mastery of emotions, without suggesting the possibility of the alternative explanation: a strategy that just doesn’t work. Although these traders are not following a precise algorithm, they could be, if only they were able to define their trading strategy with sufficient precision. The “emotions” factor could then be taken out of play, and the traders could see whether their algorithms were viable from a back testing approach: they would apply their algorithms to a large sample of past situations to see how their portfolios would have performed with fear and greed outside of the picture. It’s not true that favorable back testing guarantees positive future performance, but it is highly probable that in day trading, back testing that yields negative results implies that the algorithm would not perform well in the future. Yet no time is spent on initial back testing to weed out poor strategies; instead, these strategies are first tested in real time over a span of costly years. If these traders really wanted to see whether discipline was at the heart of the problem, they could still do it – but they don’t, because it is both emotionally and mathematically challenging to embark on an attempt to disconfirm their hypotheses. However, if only they sought to disconfirm hypotheses from the start, before they became so invested in them, then alternate hypotheses showing more promise could have been tested over the years. In day trading, periods of success are overly attributed to evidence that the strategy works, and periods of failure are attributed to failure in application of the strategy. The strategy itself is kept insulated from criticism. And because of the difficult in separating the signal from the noise, the illusion easily persists. How often have you walked past the tray of cookies at your office and noticed that there is only one cookie left? My guess is a strangely disproportionate number of times. You could substitute “cookie” for any tray of baked goods in general (brownies, muffins, etc) in this observation. So, what’s the deal? Why is there so often precisely one cookie left? I’ve asked others. They usually claim an altruistic reason like “not being greedy.” I call shenanigans! So, why then was there only one cookie left with? On some level (conscious or not), the others considered the possibility that there is something wrong with this cookie, given that it is still there after all this time. Let’s face it: of all the cookies to have been eaten already, this one was not chosen 20 times. It is also guaranteed to have been sitting there the longest possible time of all the cookies. One more motivation: nobody wants to clean up the cookie tray. Taking that last cookie leads to some sense of responsibility for cleaning up the mess. 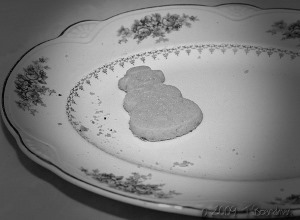 Now you can sleep at night, understanding why it seems there’s always one last cookie sitting on a plate at the office. There are plenty of popular entrepreneurship motivational bloggers who preach along the lines of “just do it.” Some even attempt to mathematically show the rational move is to initiate your startup. At the core of one popular analysis is a false premise that leads people into deciding that they should “go for it” despite their intuition. Absolutely— it’s a perfect spot to use EV. Let’s overlook the success bias that entrepreneurs in general will have in assigning a probability to their chances of success, and assume that the entrepreneur is conservative in his estimates. The problem I want to point out is that of the marginal utility of wealth. Consider that the incremental value of any dollar amount you receive will decrease each time your account increases by that amount: e.g. your first $50,000 matters a lot more to your well-being and happiness than does the next $50,000. This is known as the diminishing marginal utility of wealth. In the probability analysis, this is not accounted for. The reason your intuition tells you not to start a business is the same reason that people play it safe and “work for the man.” They have a correct gut feeling that the $50,000 / year guaranteed salary provides greater expected utility to them than entrepreneurship. Going broke in entrepreneurship means losing out on the first $50,000 (having $0 – or worse, $0 and debt). Such a great amount of the expected utility of wealth is front-loaded into that. Your quality of life would probably decline much more in this case ($50,000 to $0) than it would from the effects of going from a $100,000 salary to a $50,000 salary. Mr. Murphy’s expected value calculations are great in situations like poker games because many games are played over the course of life and you, the exceptional poker player, always come out ahead by playing the greater expected value (assuming you are wise enough never to risk everything in one hand, where you can lose everything). In the game of life, we have to consider the expected utility, not the expected value. And the expected utility of entrepreneurship is very low for most people. “The Butterfly Effect” is a fascinating theory. Even if you’re not very familiar with it, you likely believe one of its variations to be true at some level. You’ve likely seen two of my favorite movies with interpretations of this idea, “Back to the Future” and “The Butterfly Effect.” The version of the theory that interests me holds that changing small, seemingly inconsequential variations on the state of things has profound effects on the future. This version is difficult to grasp for most of us, since our assumptions about the nature of the universe are often fatalistic. For example, say that your home football team lost by a touchdown, and you were not at the game. Would your presence have made any difference in the game at all? People generally think it would not have, unless you directly interacted with the team during the game. But, consider: you’re interacting with the fans next to you, which sets off a small divergence in the way they act, which in turn affects others next to them. Effects compound over time; they are changes that continue to multiply with each other in increasing magnitude, similar to how a seemingly inconsequential change in a shot in the game of pool would have large effects if the table were sufficiently frictionless, giving the balls a chance to move around enough. Our intuitions will normally disagree with this. They are fatalistic in that we tend to believe on some level that there’s an inherent dampening effect in the universe, where our small actions that effect small changes will be mitigated over time, such that any long-term future state of the world will be indistinguishable whether we do one action or another (so long as that action is sufficiently small). In other words, the confusion seems to come from an unrecognized assumption that the effects of our actions are buffered, leading to some tendency for small actions to lose consequence over time as the state of things settles toward some “normal” state, which supposes a universe with laws akin to fate or predestination. It seems The Butterfly Effect will always stay an unprovable “theory” since we cannot test it. However, computers will be able to model the world with increasing accuracy, giving us a much more clear understanding of the butterfly effect through simulation.